Word Is Bond: "Whatever You Do, Just Make the Brand Stronger"
My experience with Brooks running shoes started a few years ago in a specialty shop, Runners Roost in downtown Colorado Springs (locally owned since 1977). I tested shoes from classics like Saucony and New Balance, the gorilla Nike, and newcomers On and Altra. Brooks fit and felt the best, so I left with a pair of their neutral, lightweight Ghost 7s for $120. Years later, I’ve since run through several pairs. Years from now, I’ll almost certainly still be running in Brooks. I rarely pay full retail for products with such fast product cycles; you can always pick up a version one or two models back at a serious discount. And yet I’ve bought two Ghosts at full retail. Here in this post, hear a customer service story about what Brooks did to make their brand stronger in the place it matters most – a customer’s heart and mind. Integrity is honesty. It’s about being whole and undivided. It’s about being true. Word is bond. Consistency in word and deed builds trust. When lived properly, brand is bond. Integrity and consistency make a brand stronger. Being completely unified in what you do, how you do it, why you do it, and – above all – how your prospects and customers experience all of it is one of the most profitable things you can do. Your company or organization is neither the owner nor the sole proprietor of its brand. Instead, you’re its caretaker. Your brand lives in the hearts and minds of employees, customers, and other stakeholders. Your customer owns it. 17 years ago, Brooks was on the verge of its second bankruptcy. Today, it’s a $500 million company and the best-selling brand at specialty running stores. They’ve produced the first- or second-most-popular shoe at the Boston Marathon the past four years in a row. We sweat every last detail. We’re experts at balancing art, science, and runner insight. We live, work, and run as part of a global community. No matter the question, the answer is ALWAYS THE RUN. Their “one thing” is right there. Plain as day. Explicitly stated. They only make running gear and their standard is being the best in the world. Every activity that honors this belief makes the brand stronger. This is at the core of an ethos of customer centricity. To see how the other beliefs complement this one, click here. Recently, Brooks discounted their outgoing models in a Summer Sale. I clicked through a well-targeted ad, so the ads started following me around. I browsed the site a couple times but didn’t have an immediate need. I always keep two pairs in rotation and the oldest still had another hundred miles to go. In the Customer Care area of the site, I noticed a Defective Product Claim form. I’m attuned to customer service, customer experience, and customer care. I work at a software company (BombBomb – we help you get face to face at scale through simple video messages) and pay close attention to customer feedback, communicate directly and often with prospects and customers, and have an interest in the types of support tickets that come in. It’s always helpful to have one person’s support issue corroborated with one or more like it; this begins the process of replicating and eliminating any issues with the software. An isolated case is more difficult to address. 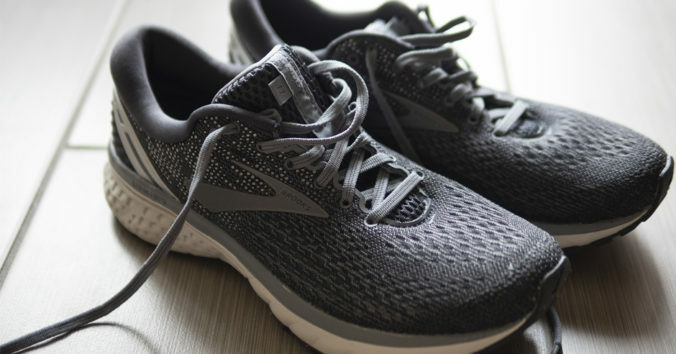 With this interest and sensitivity in mind, I decided to potentially corroborate another Brooks customer’s support issue to help the company identify a design or production flaw. The Ghost 10s include a new, soft ankle collar that runs all the way around the back of the shoe. Mine opened up a little and tore away on both the left and right shoes in about the same spot. 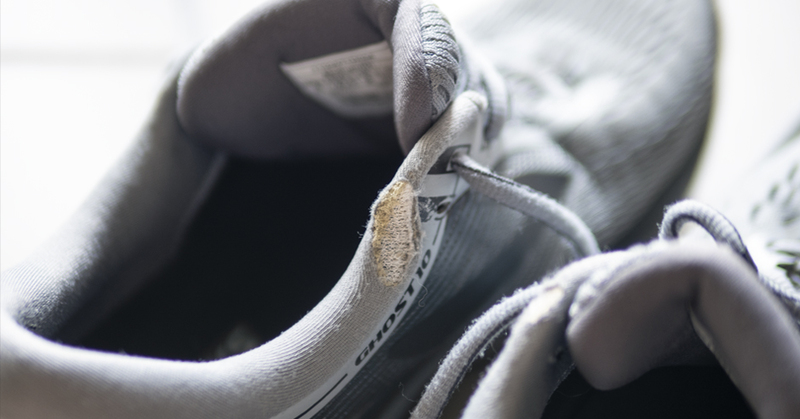 I’d not seen or experienced that wear on any of my previous Brooks shoes – or any other shoes. It’s a minor and superficial defect, assuming it doesn’t continue to tear further, but I thought they might want to know about it. I immediately received notification confirming the form fill (top email in the image below). It’s not cold, but it’s not warm. The “Have a wonderful day and Run Happy” sign off is its warmest element. They set expectations (2 business days), then exceeded them with the next email. Within 12 hours (not 48), I received the second message seen in the image below. They didn’t just offer an apology, though they did apologize. They didn’t offer a discount or coupon. Instead, they offered “the Ghost 11 as an upgrade for (my) replacement.” They offered a new pair of the new model and provided a link to pick out my color. They provided $120 retail make good on a small defect. No fuss with packing up my Ghost 10s (which I’ll run in for another 6 months or so). No further evidence required. Just click and pick. I clicked through and chose gray again. Gray goes with everything and I generally prefer my shoes be understated. If they’d gone with a dark sole instead of light, the 11s would be nearly perfect. The next day, they sent the third email seen below. Another apology, but a stronger one that reflects their beliefs – their brand. The first was for “the issue (I was) experiencing with (their) shoes.” This one is for the Brookes shoes “not living up to their name.” They sweat every last detail. They work to be the best in the world. This is how to make the brand stronger. 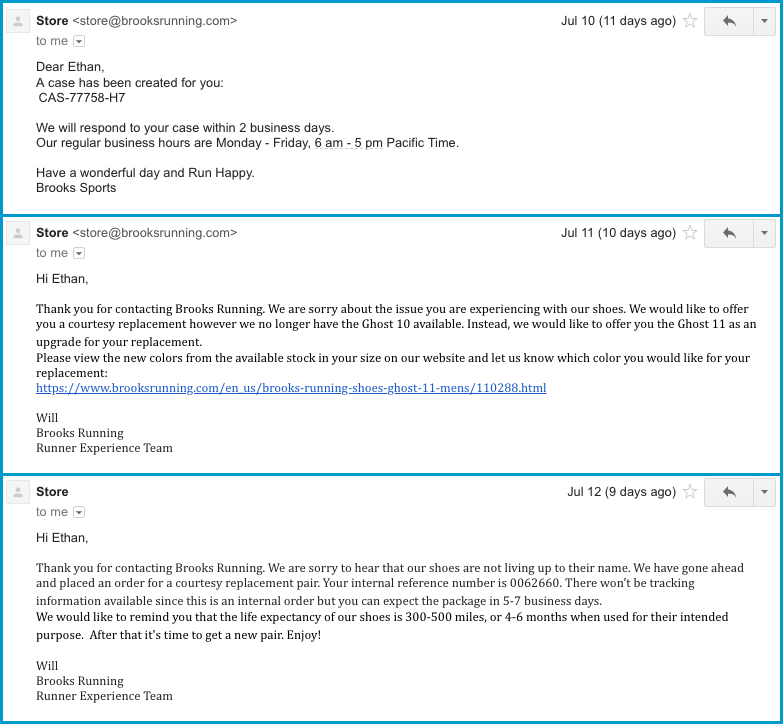 NOTE: When I spoke with Rachel Ostrander, Director of Runner Experience at Brooks Running, on The Customer Experience Podcast, she noted that they’ve dramatically improved this email experience. They’ve reduced system generation in favor of direct customer empathy. Brooks promises free shipping and free returns on every order. Their True Blue Guarantee gives you a 90-day return on anything you use and a full year for anything unused. It’s no surprise, then, that my new Ghost 11s arrived within a few days. Brooks exceeded expectations every step of the way. As return “thank you” back, I ordered about $120 in apparel from their Summer Sale ($160 in value). Click here to listen to our entire podcast conversation about customer support, customer service, customer experience, doing the right thing, and more on The Customer Experience Podcast. Having been through this experience, Brooks handling of the issue seems so obviously right at every step. Frictionless. On brand. Remarkable (or else I wouldn’t be writing this post or sharing the story on social). And so there is. Here are two stories shared by two friends of mine on my original Facebook post about this exceptional customer experience. Regrettably, some brands make it difficult. Basically: leave us out of it and figure it out on your own. How frustrating! I bolded some words and phrases in Amanda’s comment to draw attention to how much this matters to us. Our relationships are not rational or logical. Instead, they’ve got a strong emotional basis. Even if we know these issues are not personal, they can feel that way. Trust is a feeling, not a thought. Integrity is being, not thinking. And brand is both. To make matters worse, not only does a retail partner now know about this product failure, Keen also made it their problem! Most retailers carry multiple brands. Keen has competitors. Where have the clerks steered people who don’t yet have a loyalty or don’t have a specific product in mind? Where will steer the next person? Matt goes straight to the bottom line. Violations of our trust cost repeat and referral sales, the easiest sales to close! Whether you go heart (brand) or mind (revenue), the right thing for Brooks or Keen or La Sportiva to do is what Brooks did. They’re still ahead on my purchases. But like the heart and mind, the two cannot be separated. They’re necessary and complementary parts of a whole organism. A problem with one results in a problem with the other. Several of the sales and marketing details in this post came from a great story by Bloomberg titled Why Brooks Needs Runners Who Hate to Run. Turns out, I’m among the 28 million Americans who run regularly, but don’t race. I don’t need more t-shirts and I don’t need to pay to run. That’s one of the most freeing things about running – all you need is a pair of decent shoes. Another 19 million do participate in races. An interesting stat from the running and cycling app Strava: about one sixth of runners who log more than 30 miles a week wear Brooks shoes but only 3 percent of those who run less than 10 miles a week wear them. That’s a 5x ratio! They’ve got strong share among heavier runners, but not with light runners. The story positions this as a problem. And it may be if you seek continued, indefinite growth. But if you truly seek to “make the best running gear in the world,” I caution Brooks on running down market. When you design, produce, and market for everyone, you do it for no one. One of the first things Weber did as CEO: eliminate nearly all of the product line (cleats, tennis shoes, basketball shoes, cross trainers) and focus specifically on running shoes. I encourage them to make the brand stronger by maintaining that focus and serving that belief. Word is bond. If you have a good, bad, or ugly customer service story (or any other comment), share it below. Thank you for checking out this post! I write like I run – for myself and without a clock or goal. So, I appreciate you coming along on this one. 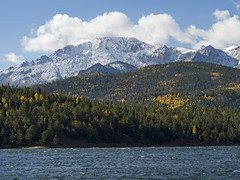 Thank you for the inclusion in your blog post. Great message and important reminders about knowing who you are as a brand, staying in your lane and that a brand is what you do not what you say your do. Thanks for sharing so many great words and important ideas. Anything about branding that I didn’t learn directly from you was stoked by a passion for it that you inspired.